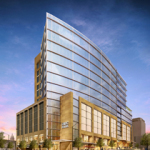 Opened in November, the glass, stone and stucco IBC Bank Plaza was designed by award-winning architecture firm, HKS. Our evening will take place on the breathtaking 13th floor with a landscaped terrace and views of Republic Park and the Capitol. Free guest parking will be available in the dedicated garage. Originally from Nicaragua, virtuoso guitarist and Texas A&M professor Isaac Bustos is one of our favorite performers. 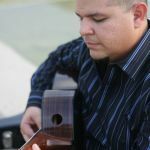 An international award winning concert artist, Dr. Bustos is a member of the Texas Guitar Quartet and has appeared as a soloist on all of our series. Our featured artist is Austin’s beloved Fidencio Duran. 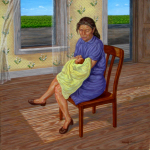 One of Duran’s most prominent works, The Visit, graces the length of the ticket counter at the Austin Bergstrom International Airport, and his artwork appears in public and private art collections throughout the United States and abroad.